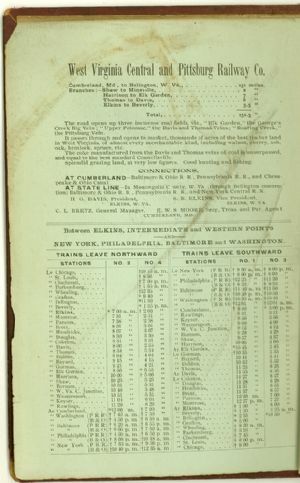 West Virginia Central and Pittsburg Railway Co.
Cumberland, Md , to Belington, W. Va., 131 miles. Shaw to Mineville, 2 "
Harrison to Elk Garden, 7 "
Thomas to Davis, 6 "
Elkins to Beverly 5.5 "
Creek Big Vein ; "Upper Potomac," the Davis and Thomas Veins ; "Roaring Creek,"
It passes through and opens to market, thousands of acres of the best timber land in West Virginia, of almost every merchantable kind, including walnut, cherry, ash, oak, hemlock, spruce, etc. The coke manufactured from the Davis and Thomas veins of coal is unsurpassed, and equal to the best standard Connellsville. Splendid grazing land, at very low figures. Good hunting and fishing. AT STATE LINE—In Monongalia County, W. Va. (through Belington connection) Baltimore & Ohio R. R., Pennsylvania R R., and New York Central R. R.
H G. DAVIS, President, S. B. ELKINS, Vice President, ELKINS, W. VA.
NEW YORK, PHILADELPHIA, BALTIMORE and WASHINGTON.